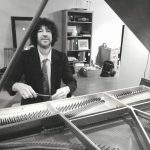 Mr. Hubert has been tuning pianos for over thirty years and has apprenticed under some of Canada’s master tuners allowing him to perfect his craft. Mr. Hubert is sought after by many establishments and individuals around Vancouver to keep their concert Steinway’s or humble uprights in perfect temperament on a regular basis. Mr. Hubert is also sought after by piano students, vocalists and other musicians as a teacher and mentor. Mr. Hubert’s recognition as a master jazz pianist and arranger attracts students and aspiring performers who desire to improve their jazz music sensibilities and absorb Mr. Hubert’s natural lyricism, melodic invention and impulsive, swinging phrasing. Piano tuning rate is $100 which includes the initial tuning visit and one follow up visit. Music teaching fees can be arranged directly with Mr. Hubert.